Parts of the UK have seen some unusually windy conditions of late. 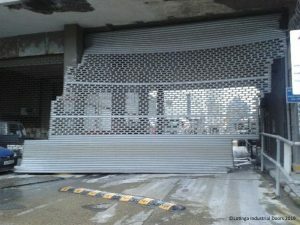 Therefore, we felt it would be a good idea to provide some tips on how you can help to avoid your industrial door from suffering wind damage. The problem of wind damage may never have occurred to you, but it can have drastic and, not to mention, very expensive consequences. 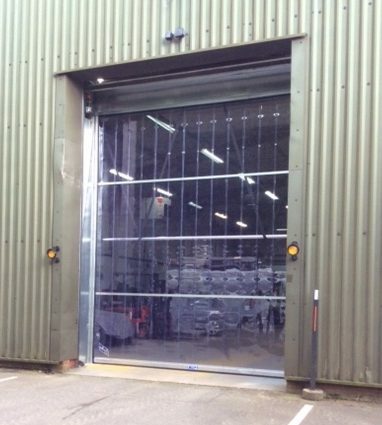 In the event of a forecast for unusually high winds, you could, as a temporary measure, place a vehicle, such as a fork truck, behind your door to stop the curtain from blowing inwards. However, if your premises frequently experiences windy weather, there are products that can be put in place to help avoid damage to your door. What is more; you could save hundreds if not thousands or pounds. The most common solution is to have larger windlocked guides installed. Windlocked guides would help to hold the curtain in place. In addition, we would install windlocks at the end of each lath. 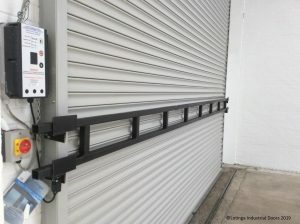 However there may be some occassions, perhaps if situated on high ground or directly facing the sea, that your premises may experience high gusts of wind; in that event, you can have a Storm / Ram Raid Bar installed behind your door. Our Eco-Strip Doors or brands of High Speed Canvas Doors must ALWAYS be raised up during windy conditions to avoid causing them damage. However, when conditions are not too windy, they are ideal for helping to keep the heat in and dust, dirt, and unauthorised personnel out. If you would like advice on this issue or a quotation for the preventative measures mentioned in this Article or other advice on Maintenance,the ideal door solution for your opening or Health and Safety?